Pamela J. Year verbally chisels out one point crystal clear: Mankato-based MRCI WorkSource is a $46 million private nonprofit business. It has never been nor will ever be a government agency. MRCI WorkSource’s 335 paid staff members create innovative employment programs for more than four thousand people with disabilities. 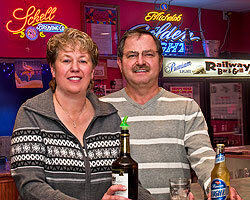 Sleepy Eye: Railway Bar & Grill – Dan and Sue Helget had their open house for Railway Bar & Grill at 300 First Avenue North about a year ago. New Ulm: The Splendid Nest – Kathleen Connell recently opened The Splendid Nest at 210 North Minnesota in the former Grand Hotel. New Ulm: European Antiques – Aini Isaksson was born in Hosko, Finland, and early on with her parents moved to Sweden. In time, she owned a cleaning business there. I’ve acquired the habit of patting myself down like a policeman frisking a robbery suspect. While the practice must appear peculiar to onlookers, I’m simply taking inventory; trying to ensure everything I need to function beyond the confines of my home or office is somewhere upon my person. In roundabout fashion, sour has become deliciously sweet for Bryan Sweet. To begin, when he was only age four, his father and mother’s marriage soured down in Blue Earth. Then Dad decided to live much closer to Mankato and would not utter another word to Bryan the rest of his life. It was painful.